Nationalism, the state of mind in which the individual's supreme loyalty is owed to the nation-state, remains the strongest of political emotions. As a historical phenomenon, it is always in flux, changing according to no preconceived pattern. 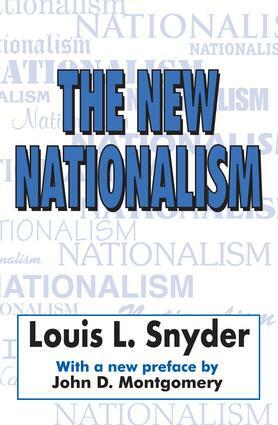 In The New Nationalism, Louis L. Snyder sees various forms of nationalism, and categorizes them as a force for unity; a force for the status quo; a force for independence; a force for fraternity; a force for colonial expansion; a force for aggression; a force for economic expansion; and a force for anti-colonialism. In Snyder's opinion, nationalism should be differentiated from Theodore Roosevelt's "New Nationalism," a phrase he borrowed from Herbert D. Croly's The Promise of American Life. Croly warned that giving too much power to big industry and finance would lead to the degradation of the masses, and that state and federal intervention must be pursued on all economic fronts. Roosevelt expanded upon this concept, and saw the flourishing of democratic government as a means of reviving the old pioneer sense of individualism and opportunity. Snyder, in contrast, extends the work of the two major pioneers in the study of modern nationalism, Carlton J. H. Hayes and Hans Kohn, in exploring this most powerful sentiment of modern times, and showing how it relates to the political, economic, and psychological tendencies of historical development.